, a celebrated Jesuit, was the son of a merchant in Dublin, and born in that city in 1569. He was educated in the protestant religion, and sent to Oxford, where, in April 1583, he was matriculated as a member of Hart-hall, and in December following appears to have been elected student of Christ Church; but having conceived an inclination for popery, he left the university, | and went to Louvaine, where he entered among the Jesuits, and had for his tutor the celebrated Jesuit Lessius. Here, by acute parts and much application, he acquired great distinction, and was appointed to teach philosophy publicly. Having furnished himself with missionary zeal and artifice, he returned to Ireland, where he became very active in gaining proselytes, and for some time laboured publicly, and without an opponent, being accounted a very able disputant. He was, however, committed to prison in Dublin castle in 1599, where he continued, some say two, and some five years, without any alteration in his courage or resolution. 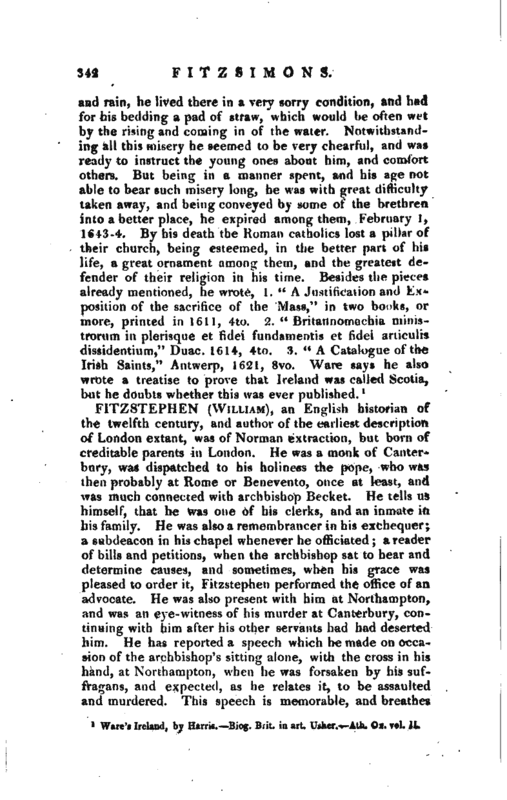 On the contrary, having thrown out something like a challenge to the protestants, the celebrated Usher, then a young man of only nineteen, undertook to dispute with him, and weekly meetings were appointed for the purpose. 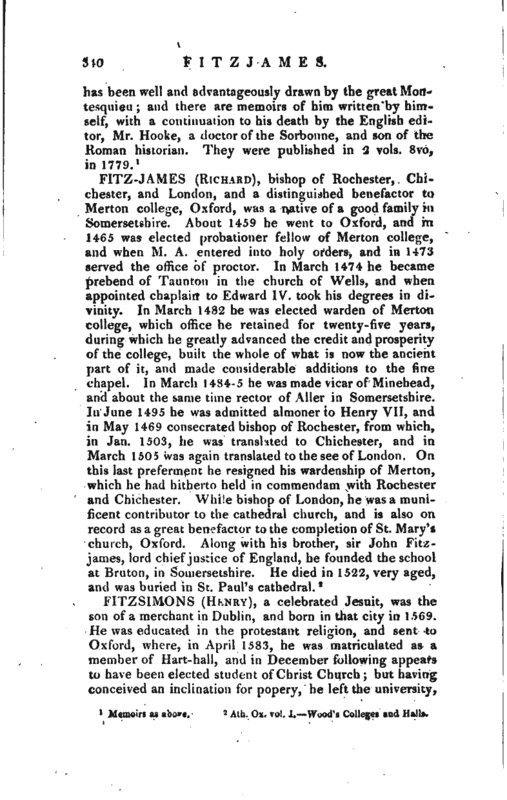 Their first subject was Antichrist, and after they had met twice or thrice, Usher was ready to have proceeded, but Fitzsimons declined any farther engagement. 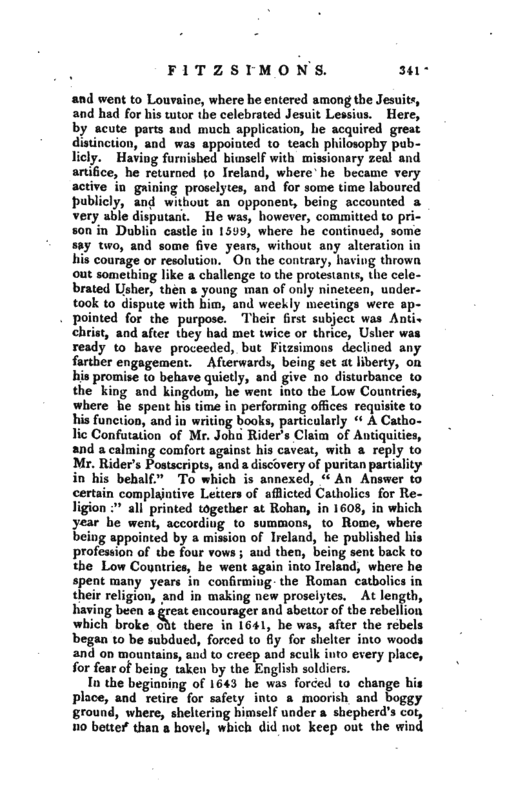 Afterwards, being set at liberty, on his promise to behave quietly, and give no disturbance to the king and kingdom, he went into the Low Countries, where he spent his time in performing offices requisite to his function, and in writing books, particularly “A Catholic Confutation of Mr. John Rider’s Claim of Antiquities, and a calming comfort against his caveat, with a reply to Mr. Rider’s Postscripts, and a discovery of puritan partiality in his behalf.” To which is annexed, “An Answer to certain complaintive Letters of afflicted Catholics for Religion:” all printed together at Rohan, in 1608, in which year he went, according to summons, to Rome, where being appointed by a mission of Ireland, he published his profession of the four vows; and then, being sent back to the Low Countries, he went again into Ireland, where he spent many years in confirming the Roman catholics in their religion, and in making new proselytes. At length, having been a great encourager and abettor of the rebellion which broke out there in 1641, he was, after the rebels began to be subdued, forced to fly for shelter into woods and on mountains, and to creep and sculk into every place, ibr fear of being taken by the English soldiers. Ware’s Ireland, by Harris. Biog. Brit, in art. Usher. -—Ath. Ox. vol. 1I.